There are now many different types of rucksacks available on the market and which one is the best rucksack for travelling is simply determined by what you will be doing on your travels and what you require the rucksack for. If you are simply wanting a rucksack to carry on an aircraft as hand luggage for a short stay or holiday, then a smaller rucksack would best suit your needs. However, if your sole intention of taking a rucksack on your travels is for backpacking, where you will need to carry a larger number of items around with you over a much longer period of time, then you should be looking at buying a larger rucksack designed for such a trip. Daypacks: Daypacks are designed to be lightweight and for use in activities such as walking when you just require it for the day. They are compact and have less features than the larger rucksacks but are ideal for providing easy access storage that is required for one day activities or carrying les items. The majority of daypacks do not have padded straps and hip belts but can be very good for using as hand luggage on planes, which can then be used for everyday use such as going to the beach and walking when you are on holiday. Travelpacks: Travelpacks are a great piece of luggage and are generally designed with the traveller in mind. They are designed in a way that provides you easy access via a front opening zip and with normally have concealed compartment for your travel documents. A large number of ‘Travelpacks’ will also have a detachable daysack, which you can detach from the main rucksack and use for everyday use whilst you are out and about in the city, at the beach, near the pool or having a meal. These really are the perfect solution for travellers going on a short break or who simply want to travel light and just take hand luggage. The more commonly used backpacking rucksack is generally larger in size than a daypack or travelpack and has more features designed to help with your travel. The backpacking rucksack is designed for multi day trips and world travel and allows you to pack much more items for your travels. Generally these types of rucksacks are best used for longer backpacking trips and are ‘checked-in’ as Hold Luggage and are not really suitable for short breaks when you just need to take Hand Luggage on board the aircraft. Climbing rucksacks are generally taller in stature than most other rucksacks and this is specifically to help increase the stability of the rucksack whilst climbing. As the name suggests, these rucksacks are designed for climbers and have several specific features for climbing such as a supportive structure that provides rigidity and durability when climbing, gear loops and attachments for ice axe and removable Hip belt. Many people like the idea of backpacking but one of the first hurdles they face, is choosing the best rucksack for travelling. There is now so much choice with regards to rucksacks and because of this varied choice, one of the most common questions people ask, is which is the best rucksack to buy for travelling? Well, the answer to this question is simply, ‘The One That Feels Right and Most Comfortable For You.’ Now this may sound obvious but it is true and although there are so many different types, models, shapes and sizes available on the market, if the rucksack you are carrying is uncomfortable, your travels are going to be miserable! This simple guide is designed to provide a few key factors that you should consider and take into account when you are buying a rucksack and as a result, will hopefully help you choose the best rucksack for travelling to the destination you intend to visit. 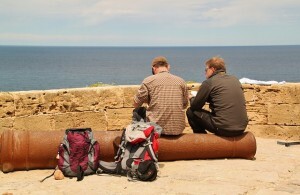 As previously mentioned, the most important factor to consider when choosing a rucksack for your travels is comfort. Forget how much it costs, what kind of brand, make or model the rucksack maybe, if it is not comfortable, then it is not the right rucksack for you. Yes, obviously you want a good sturdy rucksack for your travels and one that will endure months on the road but most of all, you want it to be comfortable and this cannot be stressed enough! To ensure that you find the all-important comfort that we have previously mentioned, there are a few important features that your rucksack should have that will provide you with the comfort you need. Padded Straps: padded straps are essential and if a rucksack does not have these, you really should avoid buying it. Padded straps offer you the comfort that is necessary when wearing your rucksack for long periods of time. Remember that when you are backpacking, you will be required to carry the rucksack on your back for long periods of time and after a while, the weight of the rucksack will begin to tell. Anything that can provide comfort is a blessing and padded straps enable this. Hip Support: Having adequate hip support is essential and as the load of your rucksack becomes heavier, the amount of load that is carried on your hips should increase. Having a suitable padded hip belt will provide the comfort and support that is required to carry your load. The majority of larger backpacks now have an adjustable back system which allows you to adjust the distance between the shoulder straps and the hip belt accordingly by either increasing or decreasing the distance depending on your height and size. This allows you to find the correct and most comfortable setting for your own torso. One of the most important things to consider when buying a rucksack is the size of your backpack. Rucksacks now come is many different sizes and these sizes range from: 40L, 50L,60L,70L,80L and 90Litres. Choosing the correct size of rucksack for your travels is essential and although you can buy 90L rucksacks, it is advisable to choose a rucksack no bigger than 70L when travelling. The reason for this is very simple, if you have any larger size than 70L, it will feel like you are carrying a small house around on your back! Think of it this way, the bigger the rucksack you have, the more you will pack in it and this generally means that you will pack a lot of items that are not necessary, simply because you have the space to fit them. Expansion Section: An ‘Expansion’ section on a rucksack is simply an extra piece of material (at the top of the rucksack on the opening) and is a very useful feature to have, as it allows you to increase the storage of the rucksack if you have to overfill the rucksack at anytime. The majority of rucksacks are somewhat water resistant, especially the main body of the rucksack. The more expensive rucksack should certainly be water resistant but if possible, try to find a rucksack that has a rain cover attached. Most rain covers are situated in either the base or lid of the rucksack and can be packed away when not in use. Having a rain cover is not only very useful in protecting your rucksack from the rain or other water hazard but it also provides protection for your rucksack when travelling. Remember, when you are backpacking around the world, your rucksack will be subject to all different types of abuse from being thrown onto buses, planes and trains. The added bonus of a rain cover is that it also offers protection for your rucksack from thieves who may target vulnerable traveller. Bellows: Bellows are simply collapsible pockets that can be used for extra storage and if required but unlike fixed pockets, can be packed away when not in use to keep your rucksack nice and compact. When you buy a backpack it is nice to have one which offers you easy access to your belongings or necessary items that you may need. Having various compartments that can be accessed from the top, sides and even the bottom is very beneficial. Fixing Points: Fixing points are a great additional extra to have but not essential. However, if your rucksack has additional fixing points, it allows you to attached a number of different items to your rucksack if required. Base Opening: Base openings are a handy feature, that allow you to access your rucksack from the bottom. However, these are generally only found on the bigger sized rucksacks. You want your rucksack to be that is breathable and you don’t want something that will make you sweat the entire time you are wearing it. Equally, you want a compact frame that is concealed and not one that is sticking out. If you are buying a rucksack to go travelling with, you certainly do not want to scrimp on price and you should ensure that you buy a rucksack that is strong, durable and will not fall apart after a couple of months. The price on rucksacks certainly vary but a good quality reasonably priced one should be adequate. If your budget will allow, it is better to pay a little more in the beginning as it will save you money in the long term. As you can see, there are many factors to consider when deciding which is the best rucksack for travelling and we hope this short guide helps you choose the right one for you.